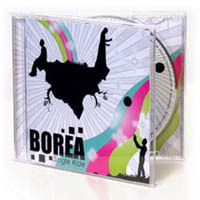 Borea three member band from Europe (creating in English, residing in France, with some Swedish roots). They describe their music as a clash between britpop and baroque rock’n’roll, but for the music-genre challenged (like me!) indie pop-rock is an adequate description. The songs are well arranged, vocals are exactly where they should be (at least for my ear!) and extremely catchy after a few listens. The torrent contains only five songs, but if you love the music, the full album is available on their website for 6 euros. 2006 was the year when the BOREA project took shape in Nancy, France, where Fred was then a student in Computer Science. The four-member band gave public performances in the East of France (Nancy, Metz, Belfort, Montbéliard where Fred comes from) and in Luxembourg. They also recorded their first demo under the name of “The Washing Machine”. Last but not least, in 2007 Fred and Kris left Nancy, moved to Paris and Nico joined them on the drums. More stimulated than ever, the band quickly got a new pop identity when the band’s various influences converged. They soon performed in several spots in Paris. With no label or producer, the band decided to put a lot into the project of a debut album. The tracks were recorded in studios, Fred and Kris’s living room and even in Nico’s kitchen! During the conception of the album, the band is involved in the music conception of a 3D cartoon for French TV.